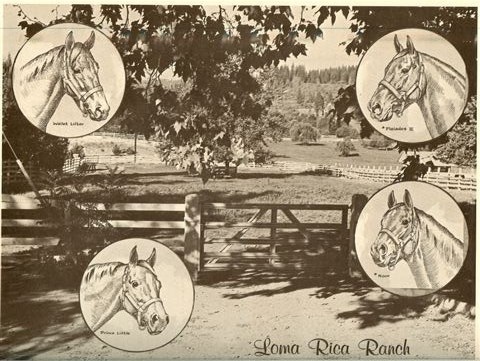 The famous racehorse Noor’s grave was identified using ground penetrating radar at Loma Rica Ranch in Grass Valley, where a business park is planned as part of a big housing project, I have learned. The search for Noor’s remains occurred during a recent tour of the project with the Grass Valley Planning Commission. Local Tom Nichalson used the GPR to find Noor, according to Charlotte Farmer, who has championed the effort to honor the famous thoroughbred racehorse. “Thanks to Jon Peek (the vet who put Noor down) and current thoroughbred trainer John Shirreffs (once a regular at Loma Rica), Tom found him almost right where Dr. Peek said he was,” Charlotte told me. In its heyday in the ’60s-’70s, thoroughbred racehorses trained routinely on the 1/2-mile oval. Freitas had been a manager of the ranch, built by Errol MacBoyle, of Idaho-Maryland Mine fame. Shirreffs trained horses at Loma Rica and now trains Zenyatta, now reigning supreme in the horse racing world. Noor, who set three world records, was put down in November 1974, at the age of 29. The horse was owned by Charles Howard, the same man who owned Seabiscuit. Noor beat Citation and has been inducted into the National Museum of Racing and Hall of Fame in Saratoga Springs, New York. As I have been reporting, thoroughbred aficionados and Noor fans such as Farmer are worried that the horse’s grave may wind up as a business park. They want to honor the horse with a statue. The local media, including The Union, has not written about the effort. Farmer and some other Noor fans have complained their letters are not being published in the newspaper. I wrote earlier about the revised plan for Loma Rica, which originally called for a horse park, not a business park. The background is here. I was on the recent Planning Commission tour of the Loma Rice site. The “new” version of the development plan is tragic. I’m writing a detailed discussion of the propsed changes to the development plan. An award winning, forward looking project is now looking a lot like low density, Roseville style sprawl. A new out of are developer form the Bay Area called the Castle Company is now running the show and only seeks profits. Community support for the project is quickly turning into opposition. I want to thank Jeff for the wonderful write-up, and there are not enough words of “thanks” for Tom Nichalson. Without him it would have been a much more difficult journey. He volunteered his time and his GPR equipment to help with locating Noor. One might wonder, why is it so important to save this grave? Part of the reason is that in all the thoroughbreds that have raced or are currently racing today only a few attain a level of success that stands them a head above all the rest. Noor is part of that elite group. In 1999 Thoroughbred Champions: Top 100 Racehorses of the 20th Century listed Noor 69th as determined by The Blood-Horse’s Top list. Not too shabby. I once again ask that you care. Please speak up. Noor deserves that! It is sad when a developer comes in with no regard for history. Would it be that much of a sacrifice to preserve this small plot of ground? No one says the developer has to erect a monument. That can be done by private efforts, but to preserve a very small park with access for those who care to remember would be a small gesture of good faith and respect for both the local community and the thoroughbred racing community. Noor beat Citation 4 out of the 5 times they raced. He was one of the greats, and certainly deserves a monument, or at least to rest in peace. We would do better to have a meadow of rememberance rather than another stupid ugly mall. I was at Santa Anita in 1950 for the Handicap, and there was no way that the Calumet entry of Citation, Two Lea, and Ponder was going to have a problem with the rest of the field. But along came Noor, carrying 109 pounds and he blew them away. Then followed the San Juan Capistrano Handicap and the weights were more even. It was one of the great races of the decade, but the result was the same. Next they went to Golden Gate Fields, and Citation set the mile world record, but without Noor in the race. But then came the 49ers Handicap and the Golden Gate Handicap. Noor took them both, obliterating the 1 1/8 and 1 1/4 world records. This was one incredible horse, and to hear that his grave site was lost and might be paved over was really very sad. I’m glad to hear that’s not the end of the story.